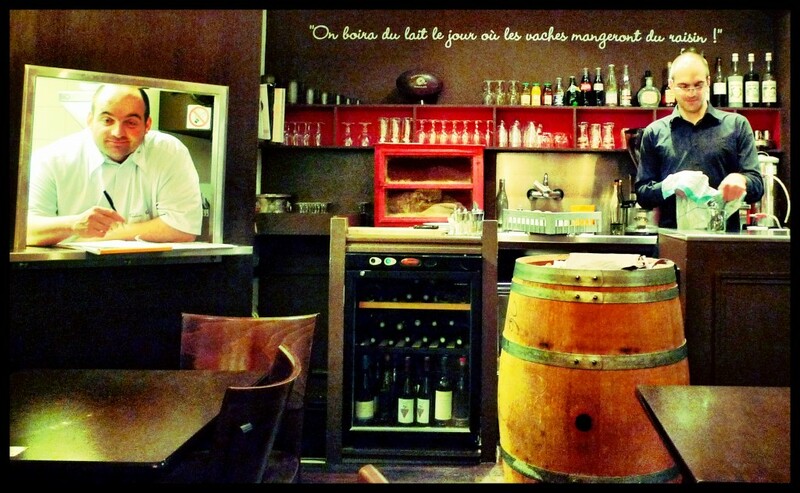 The writing is on the wall – “We”ll drink milk the day cows start eating grapes!” Have to love the French! This entry was posted in Uncategorized on May 10, 2012 by admin. I am yearning for France at the moment. 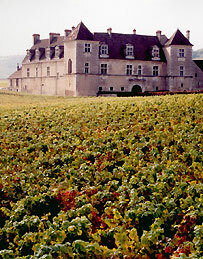 Maybe it is the fact that we have had a grueling long, gray winter here on the West Coast, or maybe because we have now bought our plane tickets and are counting the days until we return to Burgundy. 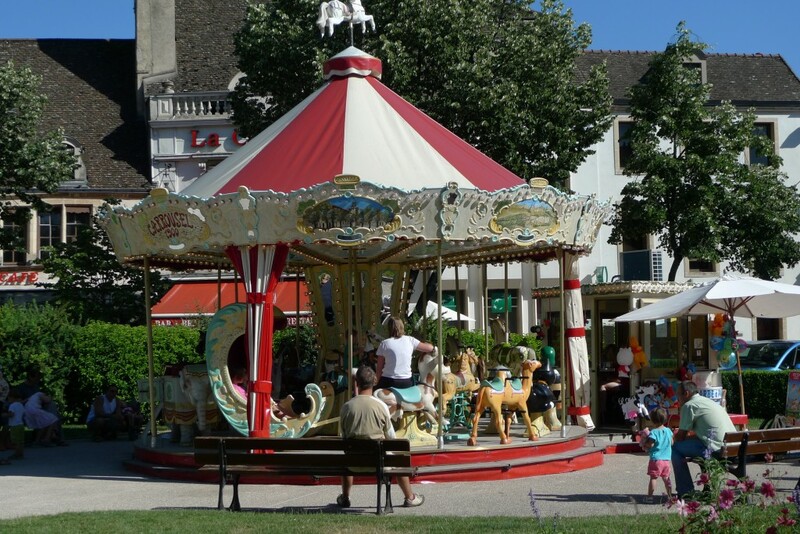 Mostly, though, it is because my sister Jayne, her husband Mark, and their daughter Anna have taken up residence in La Maison des Chaumes for the past week while they are on vacation in France. The weather has been stupendous – today apparently the thermometer got as high as 30 degrees. In Victoria today the high was 8 degrees. Aie aie aie. 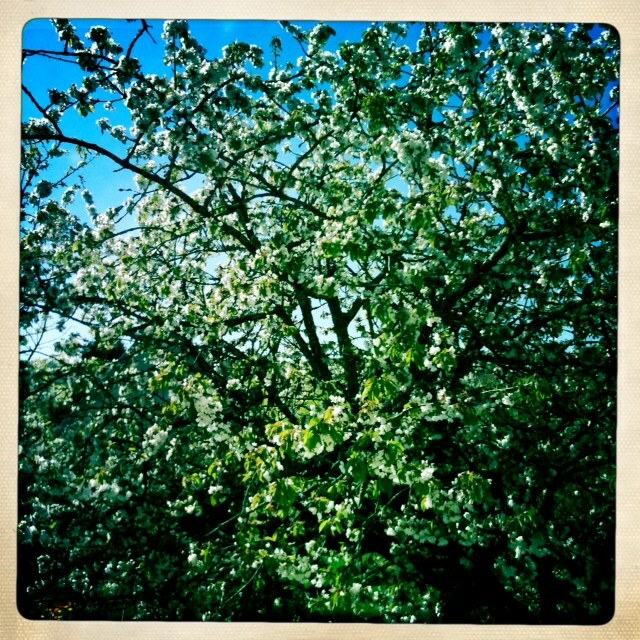 And then there is this photo Jayne sent me of our cherry tree in the backyard in full bloom. During the five years we lived in Burgundy looking out my kitchen or bedroom window to this profusion of white blossoms meant that Winter was truly over and Spring had officially arrived. And then there was Jayne’s second photo – a shot snapped from our wrap around deck of the village houses and the fields beyond. The Burgundian Spring turns the fields and vineyards such a bright green that you have to blink a few times before it sinks in that such a colour truly exists. As a backdrop to the stone village houses, there is nothing more stunning. Long, leisurely meals out on our deck, waking up in the morning to warm air and cool tile floors…I may be typing this up in my parents’ playroom, but in fact I am in our house in France, looking out the window. This entry was posted in Uncategorized on April 7, 2011 by admin. This entry was posted in Uncategorized on April 4, 2011 by admin. If you are coming to our area of Burgundy this year, I can’t recommend cooking classes from Marjorie Taylor at The Cook’s Atelier enough. Just click here to read her latest lovely blog post. 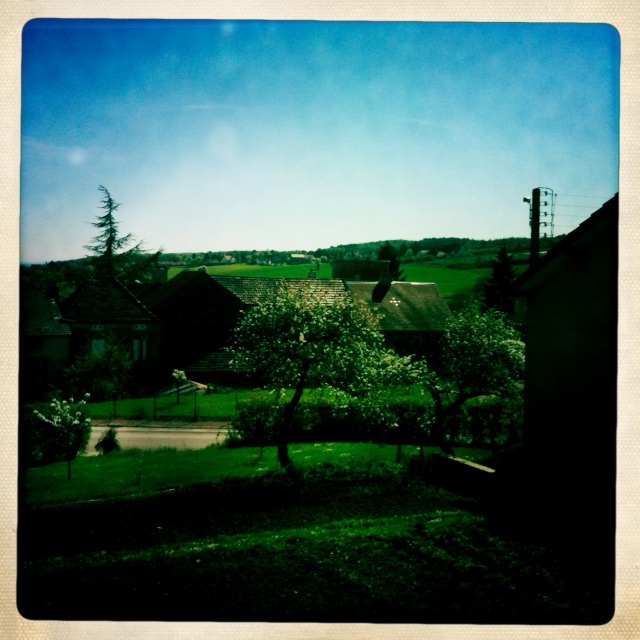 This entry was posted in Burgundy and France Travel Info., Uncategorized on March 24, 2011 by admin. Check Out Who Made #1! This entry was posted in Uncategorized on March 23, 2011 by admin. Saint Vincent Wine Festival this Weekend in Corgoloin! Very important news for anyone is Burgundy this weekend. 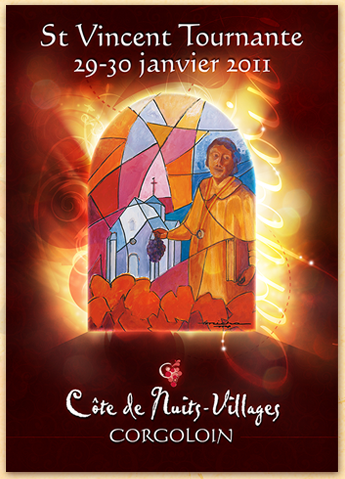 The amazing Saint Vincent Wine Festival is being kicked off tomorrow morning in the nearby village of Corgoloin. Even more amazing, this year they have actually managed to translate the festival website into English! I wish I could be there. If you can be, please drink lots of good local wine and sing a “Ban Bourgingon” for me. I’ve been busy with updating a few of my ads for the new year and have been rifling through photos I took of the houses this summer. 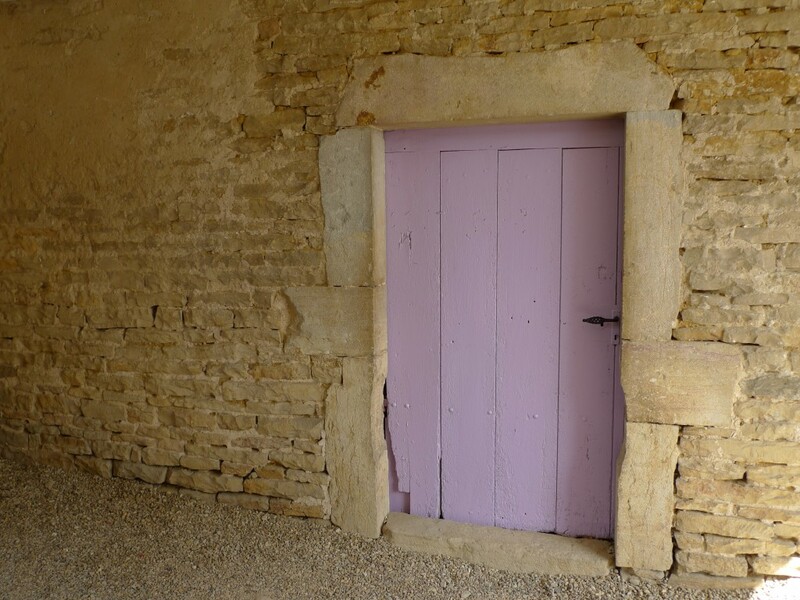 I keep coming back to this one even though it isn’t at all appropriate for an ad; it doesn’t show much besides the freshly painted door to the cellar at La Maison des Deux Clochers. And yet I still keep coming back and staring at it, and warm contentment washes over me every time I do. Am I the only one? Here it is! 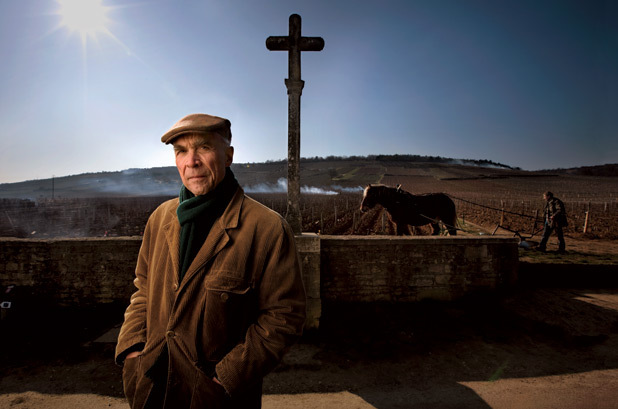 As promised, voici the third and final part of the Epicurious articles about Burgundy. This one concentrates on Beaune, one of my very favorite places (and the town where Clementine was born). Now that the Holidays are over and we have completed our invasion of my parents’ home until our new house is complete I am back to my computer. Before Christmas my sister Suzanne, who is now in the throes of planning a family trip to France this summer with the families of two of their closest friends, sent me this photo. 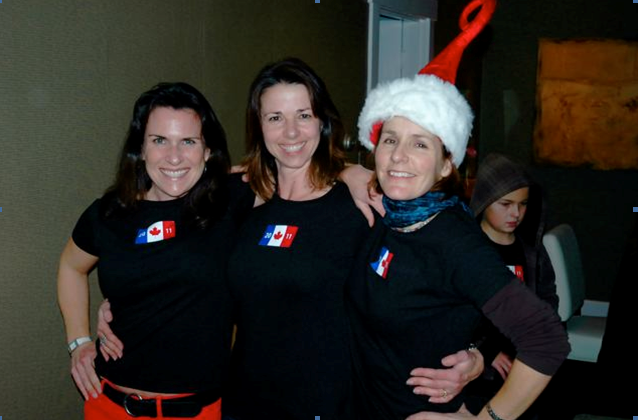 For their matching trip T-shirts my very clever brother-in-law Greg designed the coolest Franco-Canuck logo that I have ever seen. He merged the French and Canadian flags – now why didn’t I ever think of that? The result is a logo that is minimalist, chic, and speaks volumes. I think he should patent it. It looks fantastique on the fetching ladies above or their offspring below. 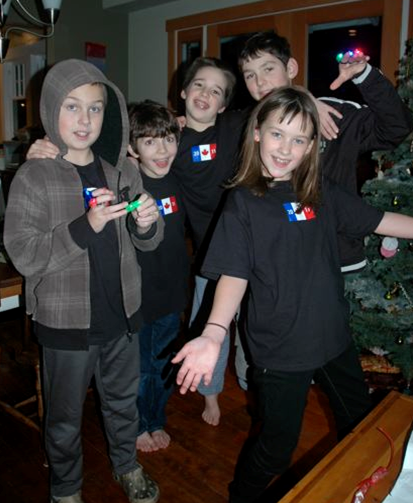 The only member of the group who wasn’t conquis is the youngest who has boycotted the whole group T-shirt thing because they don’t come in pink. You will be finding her a few years from now at Fashion Week in Paris. This entry was posted in Uncategorized on January 5, 2011 by admin.